With the usual quid pro quos of a highly variable duty cycle, this kind of sleep current might get me in to multi-year territory on 3 AA cells. For the new set of builds, I have made a few changes to reduce the power consumption of the logging platform. With a design goal of one year, continuous operation, I have decided to leave out the Pololu switch, as it wastes too much power when you only have 3 AA’s. The Muve music SD cards from eBay have all been great low current sleepers, bringing my typical build with a Pro Mini clone board into the 0.25mA range. Powering the Vcc line on the RTC from a pin on the Arduino saves another 0.089 mA, and taking advantage of the MCP1700 on the Rocket Ultra brings my best builds down to 0.13mA with a sleeping SD card (~ 60 µA) and an ADXL345 running (~ 50 µA) to provide interrupts. Of course, there is always the chance that the RTC will not survive repeated switching on it’s power supply, so I will only test this technique on a couple of units in the next deployment. If they survive without running the CR2032 coin cells dry, I will adopt this modification for the whole Cave Pearl line. It doesn’t sound like much, but that little RTC breakout will eat 600 mAh (1/4 of a AA) if you power it from Vcc for a year. 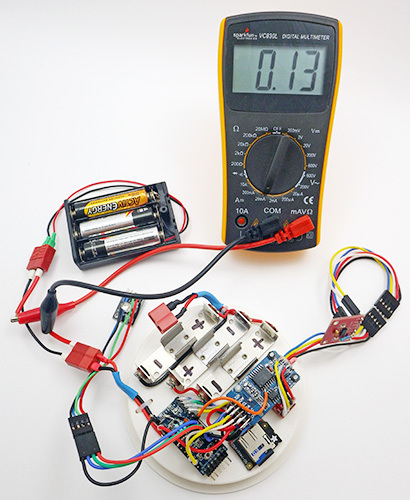 As a point of comparison, I tested an “unregulated” TinyDuino stack with the same code, SDcard, RTC, ADXL and battery pack, and it only went down to 0.55 mA while sleeping. Lifting the tiny light sensor board I2C lines, and having the SD card in place, means that the Tinyduino stack actually had two live voltage regulators, while my Rocket based loggers only have one. (Also, I don’t think they are pulling up the unused data lines on their SD shield, so floating pins might be increasing the SD sleep current a bit.) And while having a regulator on every shield affects my particular application, I can see lots of good reasons for that aspect of their design. I still love the overall form factor of the TinyDuino’s, and the significant amounts time I spend soldering these loggers together has me patiently waiting for TinyCircuits to produce a generic voltage regulated, level shifted, I2C communications shield, so I could spend more of my time fixing code bugs instead of soldering (hint..hint!) It takes me about four hours to build one of these drip loggers from scratch. 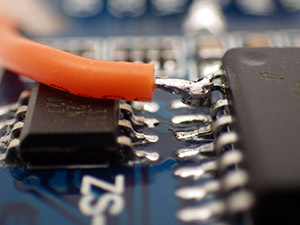 I simply let the wires I am already using to tap the I2C cascade port poke through as solder points for the EEprom. The final upgrade in this iteration the addition of a 32K AT24C256 eeprom. With the testing I did back at the beginning of the project, I know there is a chance that this much I2C bus traffic (buffering up to 512 records if I fill the whole thing) might not save much power, but it lets me standardize the data handling to one SD writing event per day no matter how many sensors are attached, or how short the sample interval is. I will have a couple of the drip sensors buffering five days worth of data on the next deployment, to see if using this eeprom to condense five smaller SD card events into one big one (which takes about 2 seconds to complete) reduces the long term power consumption of the loggers. And finally, if the unit has a catastrophic power failure that completely toasts the SD card, there is a good chance that I will be able to retrieve the records buried in the eeprom for forensic analysis. Having a second eeprom in the system also lets me “reserve” the little 4K AT24C32 on the RTC breakout for calibration data. While this is not that important for the drip sensors, it will come in quite handy as my flow sensors mature, and I start to tackle things like hard & soft iron correction on the magnetometer. The drip loggers are so quick to make & deploy, they have become my low-risk test platform for new ideas. 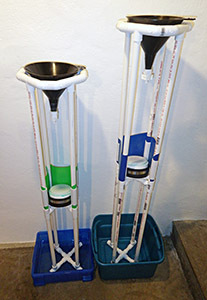 And speaking of test platforms, I now have two testing riggs set up for the drip loggers as they come off the bench, and they have taught me a very valuable lesson: Whenever you invent a new device, you also have to develop a new calibration protocol; which can turn out to be more challenging than building the actual device. Initially, I thought that all I would need for the job was a graduated cylinder and a funnel with some kind of flow limiter. But my initial test results were all over the place, with the counts varying by 30% or more from one run to the next. At first I blamed the accelerometer thinking “It must be registering multiple counts, or it is just not firing the interrupt when it should”. I tried different sensitivity settings, varied timing delays, everything I could think of. But nothing seemed to improve the consistency between runs, and after many tests with crummy numbers, I was beginning to think I must be missing something fundamental. I was so frustrated by this I decided to just sit there, staring at the little LED and counting the drops myself for as long as it took to figure this out… And I am really glad I did, because an hour into this caffeine powered exercise in utter boredom I had sore eyes, but I knew beyond shadow of a doubt that those sensors were working fine. Every drop was being counted. Every last one. So what was throwing the numbers? I made several attempts to capture photos the surface splash after a drip hits, as I thought this was throwing the counts off. 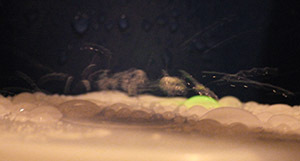 Here you see the green LED light being triggered with five or six splash-drips flying away from the point of impact. by Christopher Collister and David Mattey, published in the Journal of Hydrology. I also used heat-shrink to make a much smaller 5mm drip tube, further reducing the drip size. At about one drip per second, I am still running these a bit fast. It will be a while before I get “ideal” interval tests done as they will take at least ten times longer to perform. You can see how the larger 1000 mL volume pushed the flow rate up a bit, increasing the 500ml equivalent count up to 6548. But even at 1 second intervals, I am pretty sure my handling of the graduated cylinder is on par with drip variation as a source of error. And the two different test rigs are within a couple of percent of each other now as well. Since the GSA, I have had people asking when I would have the drip counters for sale, and this post will likely trigger a few more enquiries. Right now every unit I can put together is earmarked for my wife’s research, or projects with other researchers who are helping me improve the overall design. So before that trickle becomes a flood, I should point out that plain old tipping bucket sensors are dirt cheap, and they are pretty easy to hook up to any arduino logger you can find (some people even hook them directly to bicycle speed loggers or calculators. And if you want it wireless, you can use a doorbell). 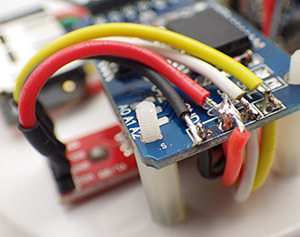 There are some very interesting alternatives in the weather station station market (like the Hydreon RG-11, though at 15-50mA it’s a non starter for battery powered loggers) There are also plenty of lab-based drip counters out there that use approaches such as IR beam deflection or even photo interrupters / optoisolators. A fair number of people are working on acoustic rain sensors. And finally there is already a drip counter on the market specifically for cave research: The Driptych Stalagmate. The Driptych uses a piezo sensor to detect the impact of the drips. While I have never seen one in person, I can guess that if they are able to use the voltage spike from the piezo to trigger the interrupt line directly, their loggers might be able to operate with an extremely low sustained power draw. In comparison, my accelerometer based approach will probably always pull at least 0.06 mA to keep the sensor ticking over, so I have a ways to go before I reach the four years of operating life they offer, not to mention all the other little bugs I still have to sort out. I am just having a heck of allot of fun doing it. I recently tried replacing the accelerometers with some very sensitive 18020P shake switches. This removed the constant power drain of the accelerometer, but they also made it fiendishly difficult to adjust the sensitivity. Those simple vibration detectors are not standardized very well, so you have to rotate the switch in 3d space to find the best response angle for each individual one. (unlike the accelerometers, where its just a simple register setting) Tilt it a little too far and the switch will just self trigger, not far enough and you have to hit the thing very hard (relative to drip energy) to trigger the interrupt. And when you have it in the right physical orientation for “light” drip impacts to register, the spring continues vibrating for quite a long time after receiving a “hard” drip impact. 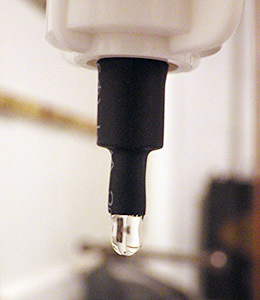 Those “echo” triggers stretch well past 150-200ms, causing the problem that when the water is really flowing, and the drop volumes increase causing harder hits, the settling time gets longer and longer, so the sensor itself imposes a fairly low maximum detectable drip rate after which the spring mechanism is just triggering all the time. This entry was posted in Developing a DRIP ⚶ sensor on December 1, 2014 by edmallon.